Physician and healthcare commentator, Dr. Soham D. Bhaduri puts forth his views on the new MCI amendment made to the disability quota, suggesting that differently-abled doctors should be tested for competency with assisted devices rather than being written off as ineligible. The Amendment Notification to the Regulations on Graduate Medical Education, 1997 notified on February 4 has become a topic of much debate. The new guidelines rule that those with more than 80% locomotor disability will be ineligible to get admitted to the MBBS course. Following the announcement, disability activists have come down heavily on this step of The Medical Council of India (MCI), citing it as unjust and a contravention of the rights of the disabled. The story of a young and dedicated physician named Dr. Mohammad Shaloo has gained particular attention. Dr. Shaloo, who worked as a resident for nearly two years after his MBBS, has been denied admission to a postgraduate course on the ground of having above 90% disability. A petition against it has been filed by Dr. Shaloo, and the MCI is purportedly in the process of amending the above directive. To me, Dr. Shaloo is reminiscent of an acquaintance from the days I was in rural service – a medical officer with post-polio residual paralysis working full-time in a nearby primary health centre (PHC). Apart from witnessing his dedication that would set him apart, it was an utter delight to see how well he connected with his patients and the way his patients would repay him. In a region that was notorious for violence and an evil perception of doctors, his image was immaculate and untainted. The reason for a general reluctance to admitting differently-abled students into medicine is the argument that training to become a doctor requires certain basic physical/mental competencies, like those involved in learning cardio-pulmonary resuscitation. In the past, medical schools in The UK and The General Medical Council itself have been opposed to making adjustments in the curriculum to suit the needs of the differently-abled. However, this idea has been increasingly challenged – not everyone trains to be an emergency physician or an orthopedician, and to disallow them from pursuing medicine on the basis of a limited number of possible future emergency episodes is unjustifiable. Many differently-abled doctors from around the world, including those who became so after getting into medical school, have had enriching and fulfilling careers, with some reaching the pinnacle of their respective fields and setting an example in human service. They have also been known to make more empathetic doctors and serve as avid general and family practitioners. While skills like CPR form a part of basic doctor’s training, to obsess over a few such requirements and overlook the larger bright side is unreasonable, and imprudent particularly in India’s context. Not to mention that huge strides have been made with respect to technology that can enable differently-abled persons to achieve near normal functional status – so that a paraplegic can conduct surgery, and one with hearing loss can do auscultations. The situation at hand requires striking a careful balance between the patient’s interest of receiving safe and adequate healthcare by a competent physician and the inalienable rights of persons with disabilities. In view of this, the Union Health Ministry’s earlier suggestion of allowing students with more than 80% disability to take MBBS entrance – and assessing their functional competency with assistive devices on selection – sounds coherent. The MCI disregarding this suggestion, setting an arbitrary level of 80% disability, and effecting a blanket restriction above it is insupportable. The Rights of Persons with Disabilities Act was passed in 2016 in line with India’s obligation to the UN convention on the Rights of Persons with Disabilities. The Accessible India Campaign launched in 2015 has supported a number of reforms for the welfare of the differently-abled, which includes making government buildings, public transport, airports and railway stations, and even websites more disabled-friendly. Given the constructive atmosphere, one wishes that similar progressive measures are applied to medical education and healthcare institutions so that they too can be made more disabled-friendly. 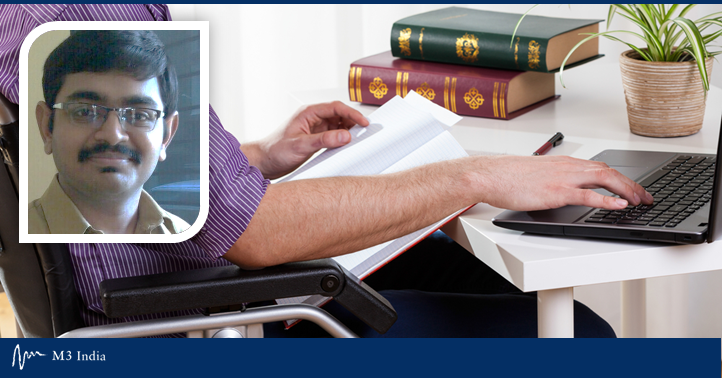 Training in medicine for the differently-abled presents a unique set of requirements of adaptations for both teaching institutes and candidates, and aided by technology and will, they are very achievable. The rather regressive stance of the MCI on this issue is disappointing. Recently, an editorial in The Journal of Family Medicine and Primary Care criticised the MCI for not giving enough attention to the specialty of family medicine in the new medical education regulations. This step with respect to differently-abled medical aspirants also looks ill-thought-out, and it is only fitting that it is rescinded and replaced with a set of forward looking and sound directives. Disclaimer- The views and opinions expressed in this article are those of the author's and do not necessarily reflect the official policy or position of M3 India.